Nestled in an inlet in southern Turkey, where the Aegean Sea meets the Mediterranean, lies the lively resort of Marmaris. Famed in previous years as a party town, many families have avoided visiting, fearing a lack of family-friendly activities. That’s hugely unfair: the safe beaches and forest-filled countryside make it a great place for an adventure – and they’re just the beginning! 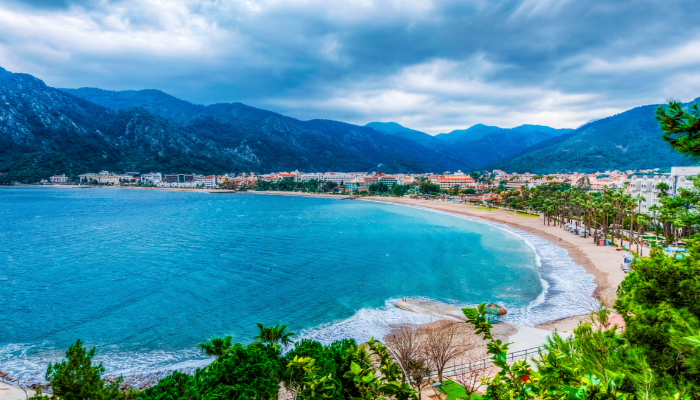 If you’ve never been to Turkey, what you picture might well be stunning beaches and beautiful old towns and, whilst you wouldn’t be wrong, you may have skipped over some of the most impressive natural scenery of the country. 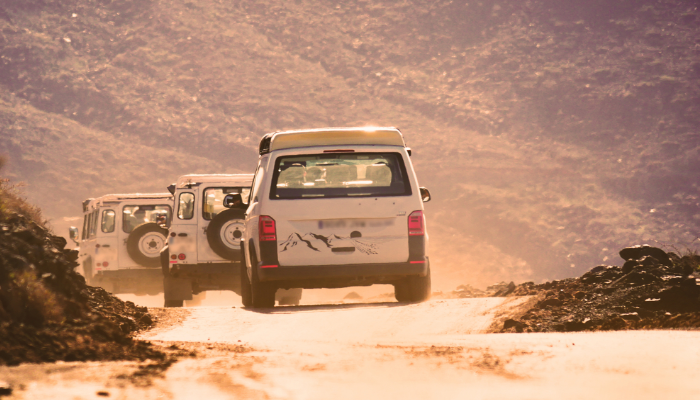 Why not take a jeep safari out through the mountains and tiny villages, stopping to marvel at the view over Marmaris bay, and cooling off in waterfalls? Hold on tight, because it’s going to be a bumpy ride! For a slightly more relaxed excursion, why not take a trip to Pamukkale and Hierapolis? 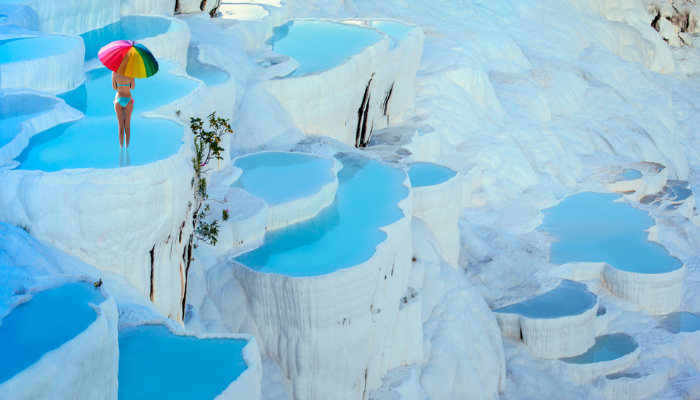 Pamukkale’s famous travertine terraces are not only insta-worthy (your teenage daughter will thank you! ), but filled with natural hot spring water. Slip in for a relaxing dip in one of the cooler ones – temperatures can get up to 100°C! – and let your worries soak away. Combine this with a trip to the ancient Phrygian city of Hierapolis, where you can wander ruins and imagine what life was like around 190BC. Anyone interested in history will be delighted – and it makes for a great back-to-school essay! Foodies and little ones alike will love the markets that Marmaris has to offer: there’s one in the region at least five days a week! 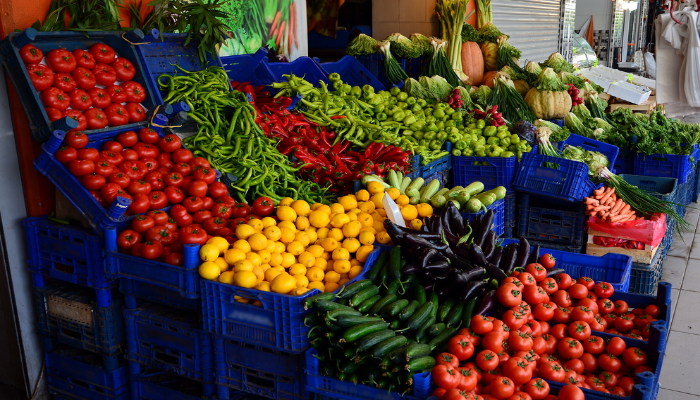 Marmaris market runs every Thursday and Sunday, and is a cascade of colours and smells. They make great photo ops, as well as being a great opportunity to buy some fresh Turkish produce for dinner! If you’re just after something relaxing, and perhaps have kids who are a little older and think that markets are dull, duh, head for a traditional Turkish bath. It’s an incredible experience and your skin feels unbelievably soft and fresh afterwards – why not take a spa day and relax with a nice dinner and drinks afterwards? It makes for a great mother-daughter activity, but the baths are open to all. Ah, and on to beaches – you can’t really go wrong with a beach! Soft, fine sand and warm, shallow water means that Marmaris’ two main beaches (Urban Beach and Long Beach) are fantastic for the whole family. Build sandcastles with your little ones, or enjoy an ice cream as you relax and enjoy the fantastic weather. If you’re up for something more active, try out a new watersport: from windsurfing to paragliding, you can find it here. Another fantastic day trip to consider is Dalyan. The incredible ancient Kings Tombs contrast with hilarious (and potentially great for you) mud baths. The impressive tombs are carved into the cliffs, and are lit up at night, which gives them a kind of ethereal property – plus you can pretend you’re Indiana Jones! Make sure you get pictures of the whole family covered in mud whilst you slather it on your skin, basking in the apparent skincare benefits it provides – hey, after the snail-mucus face mask trend, this isn’t so weird! 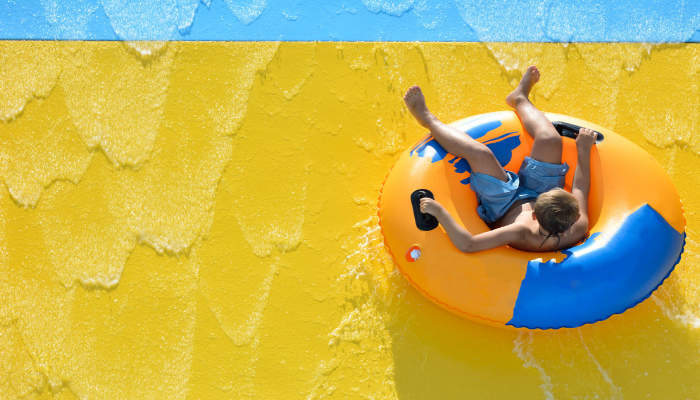 If the weather’s getting a bit too warm for your liking, how about heading to AquaDream – Marmaris’ biggest waterpark? From the colourful multi slide to the terrifying kamikaze, you’ll all have a riot, and cool off in the process! Join in the foam party, learn a rain dance – complete with sprinkled water – or shake your worries away with a belly dance! Enjoy the food at the on-site restaurant Tepe, which offers a mix of Turkish and international cuisines. 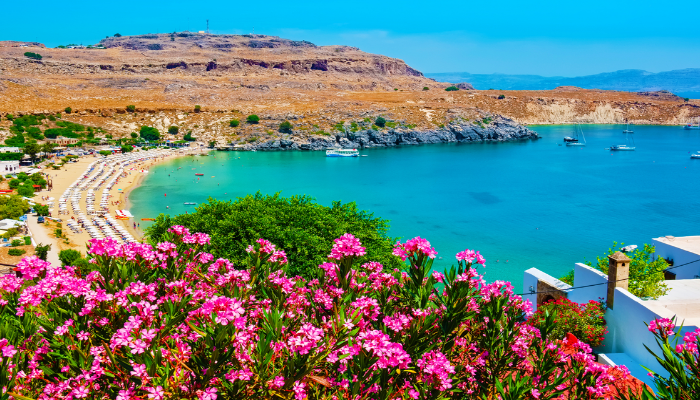 If you fancy a complete change of scenery, you can pop across into Rhodes, a Greek island, where you can sample the delicious Greek food (gyros! Moussaka!) and wander ’round the amazing medieval city. It’s an interesting way to see two countries on one holiday!